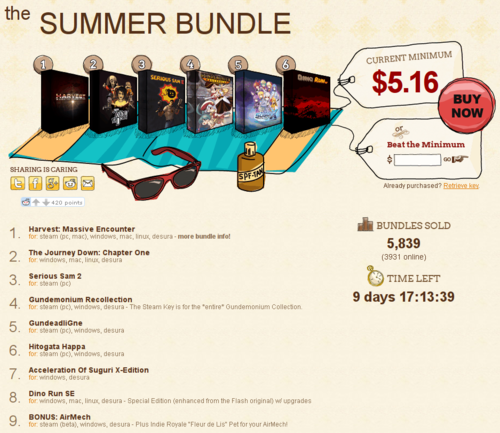 Sister site IndieGames’ co-created Indie Royale game bundle has debuted its new Summer Bundle, featuring eight notable independent games available at a bargain, fluctuating price. First up is award-winning arcade real-time strategy game from Oxeye Game Studio, Harvest: Massive Encounter, co-created by current Minecraft lead coder Jens Bergensten, and downloadable for Windows, Mac and Linux on Steam, Desura and DRM-free. In this RTS/tower defense title making its first-ever bundle inclusion, offering battles of epic proportions with a unique style of resource management and exploration. Next up is a brand new update of a classic point-and-click adventure game from SkyGoblin Games, The Journey Down: Chapter One available for Windows, Mac and Linux on Desura and DRM-free. Play Bwana and his trusted sidekick Kito who struggle to make ends meet at their run-down gas station, as they embark on a spine-tingling adventure far from home and into a twisting plot of corruption and danger. Also making a bundle debut is the long-lost Serious Sam II, Croteam’s twitch-tastic 2005 shooter sequel, brought back by Devolver Digital in 2012, and now available for Windows on Steam. IGN said of the game at the time of its release: “The action is fast and intense from start to finish. You’ll have tons of beasts to blast and a wide variety of vibrant levels to run through” – and that’s still just as true now! Also included in this bundle is a four-pack of top imported Japanese shmups from Rockin’ Android, starting with all three games from Platine Dispositif’s ‘Gundemonium’ trilogy, available for Windows on Steam, Desura and DRM-Free: Gundemonium Recollection, GundeadliGne and Hitogata Happa. The fourth game from Rockin’ Android is Orange_Juice’s Acceleration of Suguri-X Edition, available for Windows on Desura and DRM-Free. According to GameSpot, this game “offers a delicious mix of arena fighting and bullet-hell chaos.” By mixing a shmup and competitive arena fighting, Acceleration of Suguri-X Edition offers a depth-filled game, inspired by Japanese titles like Senko No Ronde, and featuring eleven levels of gameplay, a techno-trance soundtrack and schoolgirls who duke it out over who gets to eat the last pudding on earth. Finishing everything up, the bundle also features Dino Run SE from Pixeljam, available for Windows, Mac and Linux on Desura and DRM-Free. This pixel-heavy indie classic is presented in a Special Edition, enhancing the Flash original with speed runs, extra multiplayer maps, hats, and other notable upgrades. Based off a pixelated prehistoric world, escape the inevitable doom wave of extinction by controlling a speedy raptor across tar pits, crumbling hillsides and meteorite showers while gobbling up anything that gets in the way. As a one-off bonus, the bundle also includes another chance to get your hands on a Steam Windows Beta key to hot F2P action-RTS AirMech, with bonus in-game item: an exclusive Indie Royale “Fleur de Lis” Companion/Pet for your AirMech! Excusive to the Summer Bundle, this is one of the very first cosmetic items for AirMech. Finally, those who pay $8 USD or their currency equivalent during the Summer Bundle will get ‘Pixeljams Volume 1’ compilation – featuring tunes from top electronic artists like Miles Tilmann, Datassette, Mark DeNardo, + Dosh – normally a $5 value on its own. This collection of new and old tracks from the Pixeljam team (Dino Run) also includes the Wiretap EP (Kate Simko + Miles Tilmann) and a goodie bag of images, animations and other PixelJam-related stuff. Also don’t forget that Indie Royale just launched its Collection feature. 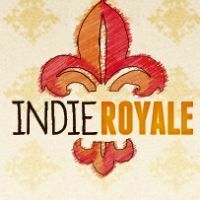 This is a page where Indie Royale purchasers can earn loyalty rewards, manage keys for already-purchased bundles, and add already-completed bundles to their Wishlist for possible bundle reappearances. More info on the Indie Royale Collection is available via this blog post. More information on the Summer Bundle, including real-time statistics and its current price, is available at its official website or via its Facebook and Twitter pages.